Is Stage Fright Considered a Phobia? Is Stage Fright a Phobia? Stage fright is not commonly thought of as a phobia, despite its ability to nearly cripple performers of all types. Officially, however, it can be categorized as a subset of glossophobia, or fear of public speaking, which is itself a type of social phobia. Stage fright may arise suddenly or gradually and may be mild or severe. Anyone who performs on a public stage, from kids in school to professional actors, is potentially at risk for stage fright. Hollywood lore is filled with tales of performers who have battled with this phobia, from Rod Stewart to Mel Gibson. One of the most famous and best-documented examples is Carol Burnett, who is alleged to have thrown up nightly before each show. It can be extremely difficult for nonperformers to fathom why anyone would choose a career or hobby that causes such obvious distress. If you suffer from stage fright, you have probably dealt with endless questions from family and friends as to why you put yourself through the torment. The answer is simple. Performing is “in the blood.” Most performers cannot imagine not performing, as it is what they feel they were born to do. The love of the work is powerful enough to overcome the lack of stability, the endless rejections, and the early morning auditions. Stage fright is just another obstacle that must be handled in the pursuit of the dream. Stage fright tends to manifest somewhat differently than most phobias. Only rarely does the phobia actually impede the performer’s ability to work. Instead, it tends to appear during the time leading up to the audition or performance. Although each person’s reactions are unique, most cases of stage fright follow a reasonably predictable pattern. The phobia generally begins weeks or months before the performance, often manifesting as a low-level generalized anxiety. If you have this condition, you may begin to feel hyperalert, jumpy and full of energy. As the date of the performance draws closer, the symptoms worsen. A few hours before show time, you may experience more traditional phobia symptoms including gastrointestinal problems such as vomiting or diarrhea, irritability, mood swings, tremors and heart palpitations. When you take to the stage, though, your performer instincts take over. Most sufferers of stage fright report that they have few, if any, symptoms during the performance. You will likely play off the energy of your audience, allowing yourself to fully go into character and forget about your earlier distress. Many performers experience a type of euphoria, similar to a runner’s high, both during and after a show. This rush of adrenaline may partly explain why the symptoms of stage fright so completely disappear when you actually confront the object of your phobia. Despite the fact that your performance may not be affected, it is important to find healthy ways of coping with stage fright. Many performers turn to self-medication, with alcohol or drugs, in an effort to dull the pain. This is never a good choice for anyone because it can turn into a dangerous cycle and possible addiction for those who perform regularly. If you suffer from stage fright, consider seeking help from a mental health professional. Like any phobia, stage fright is highly treatable. A popular option is cognitive-behavioral therapy. Many people with stage fright ruminate on beliefs that their performance will not be “good enough,” thereby disappointing their audience and ruining their own careers. Therapy can help you learn to replace these negative messages with more rational thoughts. You will also be taught ​relaxation exercises that you can do when the anxiety becomes overwhelming. 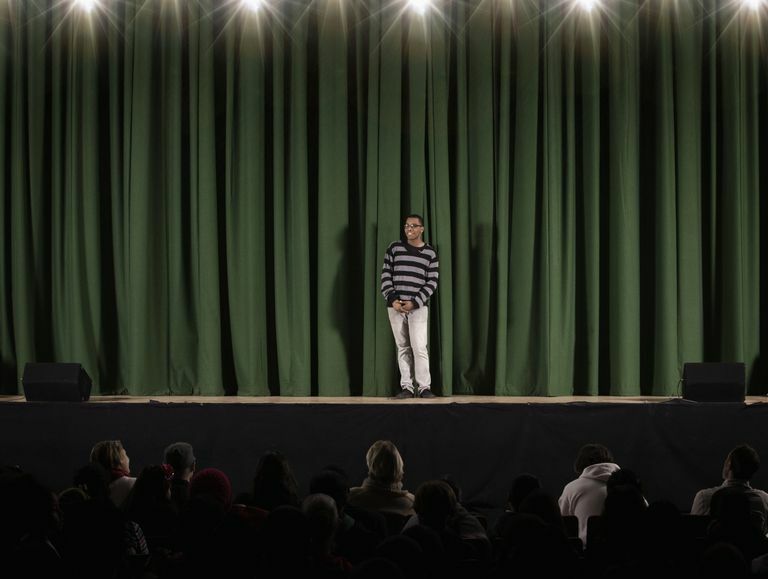 Stage fright is remarkably common, and many performers never seek help. With proper treatment, however, the condition can be successfully managed. Why Are Some People Really Afraid of Cats?